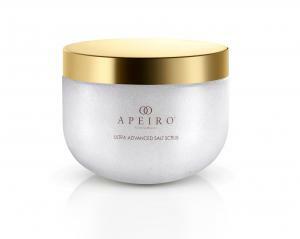 Ultra-luxury skincare brand Apeiro lifts the lid on its Ultra Advanced Salt Scrub and Body Butter. "Expertly formulated from a fortifying combination of premium sea salt and essential oils, further enriched with antioxidants and vitamin E, our Ultra Advanced Salt Scrub is a luxurious addition to any skincare regime," suggests Apeiro's vice president of operations, Eric Inbar. "Upon application, our exclusive sea salt-infused formula will immediately yield more radiant-looking, softer, and smoother skin," he adds. Apeiro's new Ultra Advanced Body Butter, meanwhile, available in a choice of two soft, light scents—attractively named 'Fresh Dawn' and 'Ocean Breeze'—is infused with nourishing oils to help hydrate and protect the skin, says the brand. "Lightly perfumed with a choice of two fresh, luxurious scents, and whipped to a feather-light texture, the formula of our Ultra Advanced Body Butter is beautifully silky and absorbs easily into dry skin without leaving a greasy residue," reveals Inbar. Suitable for all skin types, Apeiro advises applying both its salt scrub and body butter to clean skin, massaging in either product, gently, and in circular motions. All of the ultra-luxury skincare brand's products are, it says, proudly certified cruelty-free, and clinically tested.. "Our Ultra Advanced Body Butter and Ultra Advanced Salt Scrub, for example," Inbar adds, "utilize only the purest active ingredients, vitamins, minerals, and natural compounds." He continues, "Furthermore, every single one of our products is all-natural and organic, formulated to support improved skin health for long‐term beauty." Apeiro also offers a further selection of cleansing, eye-focused, collagen-based and diamond powder-infused ranges and collections, as well as a variety of standalone products including the brand's Advanced Vitamin C Cream, Exfoliating & Cleansing Facial Gel, Clarifying Facial Cleansing Foam, and its El Dorado 24K Regimen, among many others. "Every Apeiro formula is crafted to the very highest of standards," adds Inbar, wrapping up, "with each component a reflection of the power and potency of nature, offering nothing but the very best for the skin." 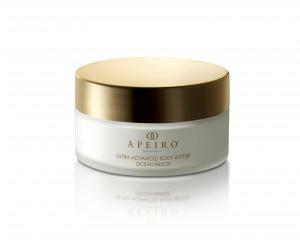 To find out more about Apeiro's Ultra Advanced Salt Scrub, or its Ultra Advanced Body Butter in either Fresh Dawn or Ocean Breeze fragrance, or any of the brand's other ultra-luxurious, all-exclusive skincare products, please head to https://www.apeirotreatments.com/.